What Are the Best Navel Jewelry Designs? There are many different jewelry designs you can use for your navel piercing. 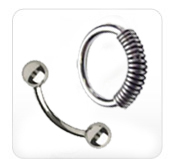 The most popular choices include curved barbells and Captive Bead Rings (CBRs). Curved barbells for navel piercings can have a classic, elegant design or can be richly ornamented with gems, dangles and charms. 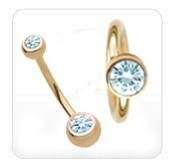 Captive Bead Rings for navel piercings typically include shiny beads or other decorative elements. It is important to use only jewelry made of safe materials that do not cause allergies and other problems. The best navel pieces are made of high-quality metal materials. The best ones to use are Surgical Steel, preferably 316 LVM Surgical Steel. Another great choice is 14k nickel-free gold, because it safe for those with allergies to nickel. Other excellent materials for navel pieces include titanium and acrylic. The size of your navel jewelry piece has to match your piercing. You need to know the gauge you are pierced with because you need to order jewelry of the same gauge. As for the length, most navel pieces come in various sizes so you can choose the ones that suit you best.